This Promotion is only applicable during the Promotion Period beginning on the start date and shall continue in effect until its expiry or sooner cancelled by TIME. TIME reserves the right to cease and/or cancel the Promotion at any time before the expiry of the Promotion Period without any prior notice. This Promotion is not to be construed in any way howsoever as a contract of sale, exchange, lease, hire-purchase, or hire between TIME and the customer. Promotion is only available to Eligible Customers and is subject to Eligible Customers meeting the Promotion Qualifications. Any customer who does not meet the Promotion Qualifications and is not an Eligible Customer is not entitled to the provision of the Promotion. TIME may change, modify, amend or cancel the Promotion at any time during the Promotion Period, including changing, modifying or amending the Value and/or type of free gift that is offered, the Value and/or type of voucher offered (including the provider of the voucher) or Value of the cash rebate offered (as may be applicable depending on the type of Promotion). Nothing herein stated shall imply that an Eligible Customer is to receive any other benefit beyond that stated in the Promotion Information Details nor that TIME is obliged to provide the equivalent Value if TIME changes, amends or modifies the Promotion. If there are multiple promotions available during the same Promotion Period, including this Promotion, and the customer is an Eligible Customer to more than one promotion, the customer must choose only one promotion. A customer cannot make multiple choices of the promotions, nor do anything to secure or gain the benefits offered in multiple promotions. Once the customer has chosen the promotion, the customer is no longer eligible for any other promotions that are available at the same time. TIME reserves the right to and may refuse to provide the Promotion to the Eligible Customer regardless of whether the customer is an Eligible Customer and meets the Promotion Qualifications. If the Promotion is the provision of a free gift or a voucher from TIME’s partners, suppliers or subcontractors, TIME and its directors, officers, employees, agents, suppliers, partners and/or subcontractors provide the Promotion on an “as is” basis and without any warranty or condition, whether express or implied, by law or by contract, including warranties as to title, merchantability, fitness for purpose, satisfactory quality, performance, non-infringement of any third party’s intellectual property or proprietary rights or product liability. Should a physical good be obtained as a free gift or upon redemption of a voucher, and the customer suffers any form of physical injury or damage, such injury or damage may be claimed against the manufacturer or distributor of the physical good and not against TIME, which is deemed not to be a supplier. If the Promotion is the provision of a Monthly Rebate or One-off Rebate (as set out in the Promotion Information Details) to the customer, then if the customer terminates the service agreement with TIME before the expiry of the minimum period or if there is no minimum period specified, then twelve months from service activation date, then Eligible Customer shall not be entitled to receive any cash rebate for the unexpired period and TIME may seek to recover all earlier provided rebates on the basis that customer warrants to stay a customer of TIME for the minimum period or twelve months (as the case may be). In addition, no advice or information obtained (whether orally or written) by the customer from TIME, or its directors, officers, employees, agents, suppliers, partners and/or subcontractors shall create any warranty or right to sue. TIME reserves the right to revise, amend, or modify these Terms and Conditions during the Promotion Period and such revision, amendment, and/or modification shall be made available at www.time.com.my and is binding on all Eligible Customers. Continued access and use of the service shall deem to be your acceptance to the changes and updates to these Terms and Conditions. If the Promotion Qualifications includes the signing up of a new service, then in such a case, all other terms and conditions governing the use of the new service shall apply in addition to these Terms and Conditions. Capitalised words have the meaning as specified in the Promotion Information Details. If in the Promotion Information Details there are Special Promotion Terms drawn up, then such Special Promotion Terms shall prevail over these Terms and Conditions in the event of conflict, inconsistency or ambiguity. 1. You must be an existing TIME customer with a valid subscription for TIME Fibre Home Broadband™ (“TIME Broadband”). 2. You may only submit referrals for TIME Fibre Home Broadband™ services. 3.1. You must provide the link generated in the referral email or in TIME Self Care portal to the Referee. 3.2. The Referee must click the link, select the desired TIME Broadband package and complete their registration for TIME Broadband online through the same link before the end of the Programme Duration using the prescribed registration form (as available through the aforementioned link) and their TIME Broadband must be successfully activated (successful activation means successful installation and activation of TIME Broadband). 3.3. The Referee’s TIME Broadband service must be successfully activated before you are entitled to the Referral Bonus. 3.4. The Referee who registers for TIME Broadband must be a new TIME customer (and not a returning or existing TIME customer). TIME reserves the right to determine in its sole discretion whether the Referee is a new TIME customer or otherwise. 3.5. You must not refer yourself. TIME reserves the right to deny the Referral Bonus if the account holder of the Referrer and Referee is the same individual even though the service address is different. 4. The Referral Bonus will be granted in the form of RM100 bill discount starting from 3 October 2017, which will be reflected in your bill statement and this discount will only offset your monthly recurring service charges. Any remaining Referral Bonus will be brought forward to the next bill cycle. 5. The Referral Bonus in the form of RM100 cash reward will be discontinued from 3 October 2017. If you have submitted a referral through TIME Self Care Portal before 3 October 2017 but the Referee’s TIME Broadband service is successfully activated from 3 October 2017 onwards, your Referral Bonus will be in the form of RM100 bill discount. 6. If you cancel your subscription for TIME Broadband prior to receipt of any entitled Referral Bonus, you are no longer eligible to receive such entitled Referral Bonus(es) under this Programme and the balance from the accumulated Referral Bonus after offsetting the final bill will be forfeited. 7. Referral Bonuses are not refundable or exchangeable with other rewards. 8. There will be no rollback once a Referral Bonus is redeemed. 9. These Programme Rules are to be read in conjunction with the Terms and Conditions below. 2. The Programme is valid for as long as TIME deems necessary (“Programme Duration”). TIME reserves the absolute right at any time without prior notification and without assigning any reasons thereto to cancel, terminate, postpone or suspend indefinitely the Programme. Referrals and/or registrations received after the Programme Duration will automatically be disqualified. Only existing TIME customers with a valid subscription for TIME Fibre Home Broadband™ (“TIME Broadband”) and a valid email address are eligible to participate in the Programme. 4.1. All referrals must be submitted using the link provided. Only referrals for TIME Fibre Home Broadband™ services may be submitted. 4.2. You must adhere to the Programme Rules and all on-screen instructions in the Referral Email or the Programme page in the TIME Self Care Portal. 4.3. You may track the status of your Referees’ application for TIME Broadband in the Programme page of your TIME Self Care Portal. If you have referred via the link provided in the Referral Email, you may still track the status of your Referee’s application in the Programme page of your TIME Self Care Portal. If you are not a TIME Self Care Portal user, you must register for an account at Self Care in order to track the status of your Referee’s application. 6.1. TIME reserves the right, in its sole discretion, to disqualify you if you are found or suspected to be tampering with the Programme, TIME Self Care Portal and/or Programme submission process or the operation of this Programme. TIME reserves the right to disqualify you from this Programme and/or to forfeit any Referral Bonus you may be entitled to if TIME believes, in its sole and absolute discretion, you have undertaken fraudulent or unfair practices and/or activities or other activities harmful to this Programme or the submission process. Fraudulent activities are deemed to include, but is not limited to any act of deceit and/or deception and/or cheating. Unfair practices include, but is not limited to, conducting any form of advertising or promotional activities to promote your participation in the Programme (i.e. to source for new Referees for your benefit). 6.2. TIME reserves the absolute right at any time without assigning any reasons and without notice to add, alter, modify, change or vary the Terms contained herein, wholly or in part at its absolute discretion. If you participate in the Programme, you are deemed to have knowledge of and to have agreed to any changes or variations to these Terms. You agree that your continued participation in the Programme will constitute your acceptance of these Terms (as varied or changed). 7.1. TIME and its parent company, subsidiaries, affiliates, officers, directors, employees, agents, suppliers and/or subcontractors provide the Programme and the TIME Self Care Portal on an “as is” basis and without any warranty or condition, whether express or implied. TIME and its parent company, subsidiaries, affiliates, officers, directors, employees, agents, suppliers and/ or subcontractors specifically disclaim the implied warranties of title, merchantability, performance, fitness for a particular purpose, satisfactory quality or non-infringement of any third party’s intellectual property or proprietary rights. In addition, no advice or information obtained (whether orally or written) by you from the TIME shall create any warranty and you may not rely on any such statement of warranty. 8.1. You shall assume full liability and responsibility in the event of any liability, mishap, injury, loss, damage, claim or accident resulting from your participation in this Programme, redemption and/or usage of the Referral Bonus. 8.2. All costs, fees and/or related expenses that are incurred during the participation in this Programme and/or during the redemption of the Referral Bonus are your sole responsibility. 8.3. TIME shall in no event nor for any reason whatsoever be liable, even if foreseeable or if TIME or its agents or employees may have been advised of, or otherwise might have anticipated, the possibility or likelihood of such damages, losses or expenses, for any damages, loss or expense, including direct, indirect, special, consequential or punitive damage, or economic loss, or any claims for loss of profits or loss of use, whatsoever or howsoever caused (regardless of the form of action, including tort or strict liability), arising directly or indirectly from or in connection with: (i) any access, use or the inability to access or use the TIME Self Care Portal; (ii) any system, server or connection failure, error, omission, interruption, delay in transmission, computer virus or other malicious, destructive or corrupting code, agent, program or macros; (iii) any use of or access to any other website or webpage linked to the TIME Self Care Portal; (iv) any services, products, or information, data, software or other material obtained or downloaded from the TIME Self Care Portal, or from any other website or webpage linked to the TIME Self Care Portal; (v) your use or misuse of the TIME Self Care Portal or Referral Bonus; (vi) sales, customs and/or import or export taxes; (vii) any indirect, incidental, consequential, special or exemplary costs, claims, expenses, loss or damages, even if informed of the possibility of such costs, claims, expenses, loss and damage; (viii) lost revenues or profits; or (ix) loss, damages or expense arising from or in connection with any loss of data or interruption in use, or availability, of data. 9.1.3.	from any claim by a third party against any Indemnified Parties in respect of (i) and (ii) above. The invalidity or unenforceability of any of the provisions in these Terms shall not adversely affect or impair the validity or enforceability of the remaining provisions of these Terms. 11.1. These Terms shall be governed by, and construed in accordance with the Laws of Malaysia and the parties hereby submit to the exclusive jurisdiction of the Courts of Malaysia. 11.2. All other terms and conditions governing the use of TIME Broadband services shall apply herein mutatis mutandis. 11.3. In the event of your breach of these Terms, TIME’s failure to enforce these Terms shall not constitute a waiver of these Terms, and such failure shall not affect the right later to enforce these Terms. TIME would still be entitled to use its rights and remedies in any other situation where you breach these Terms. 11.4. You are responsible for any and all tax liabilities associated with the Programme. Referral Bonus(es) that you receive may constitute taxable income. This promotion (details of which are set out below) is available only to Eligible Customers who meet the Promotion Qualifications during the Promotion Period only and is subject to the Promotion Terms and Conditions available at www.time.com.my/terms-and-conditions. Acceptance of the promotion gift, vouchers or rebates by Eligible Customers is deemed to be acceptance of the Promotion Terms and Conditions. Promotion Description Selected Customers who log in to TIME’s Self Care portal during the Promotion Period at selfcare.time.com.my will stand a chance to claim a Free Gift. Promotion Qualifications 1. The reward will be made available on the 15th of each month within the Promotion Period and customers will have to log in to TIME’s Self Care portal during the said period to qualify for the Promotion. 2. All active customers are eligible for the Promotion. However, customers who have successfully claimed a reward in accordance with this Promotion will no longer qualify for further rewards under this Promotion for the remainder of 2018. 3. Rewards are available on a first-come-first-served basis and while stocks last. 4. The reward will be in the form of a voucher code and customers who successfully claim the reward are required to redeem the reward as per the instructions specified in TIME’s Self Care portal. 5. For rewards which are to be redeemed at the relevant third party merchant’s outlets or premises, customers are required to log in to TIME’s Self Care portal to obtain the voucher code and present the voucher code to the third party merchant’s outlet staff for redemption and validation. 6. The rewards have to be redeemed within the voucher validity period as specified in TIME’s Self Care portal. Special Promotion Terms 1. The rewards are provided on an “as is” basis and are not exchangeable for cash or in kind. 2. The rewards claimed are non-transferable. 3. Each voucher code is available for a single redemption only. Multiple redemptions using the same voucher code are not allowed. 4. Additional terms and conditions for each reward are applicable and can be found in TIME’s Self Care portal. 1 This Promotion is only applicable during the Promotion Period beginning on the start date and shall continue in effect until its expiry or sooner cancelled by TIME. TIME reserves the right to cease and/or cancel the Promotion at any time before the expiry of the Promotion Period without any prior notice. 2 This Promotion is not to be construed in any way howsoever as a contract of sale, exchange, lease, hire-purchase, or hire between TIME and the customer. 3 Promotion is only available to Eligible Customers and is subject to Eligible Customers meeting the Promotion Qualifications. Any customer who does not meet the Promotion Qualifications and is not an Eligible Customer is not entitled to the provision of the Promotion. 4 TIME may change, modify, amend or cancel the Promotion at any time during the Promotion Period, including changing, modifying or amending the Value and/or type of free gift that is offered, the Value and/or type of voucher offered (including the provider of the voucher) or Value of the cash rebate offered (as may be applicable depending on the type of Promotion). Nothing herein stated shall imply that an Eligible Customer is to receive any other benefit beyond that stated in the Promotion Information Details nor that TIME is obliged to provide the equivalent Value if TIME changes, amends or modifies the Promotion. 5 If there are multiple promotions available during the same Promotion Period, including this Promotion, and the customer is an Eligible Customer to more than one promotion, the customer must choose only one promotion. A customer cannot make multiple choices of the promotions, nor do anything to secure or gain the benefits offered in multiple promotions. Once the customer has chosen the promotion, the customer is no longer eligible for any other promotions that are available at the same time. 6 TIME reserves the right to and may refuse to provide the Promotion to the Eligible Customer regardless of whether the customer is an Eligible Customer and meets the Promotion Qualifications. 7 If the Promotion is the provision of a free gift or a voucher from TIME’s partners, suppliers or subcontractors, TIME and its directors, officers, employees, agents, suppliers, partners and/or subcontractors provide the Promotion on an “as is” basis and without any warranty or condition, whether express or implied, by law or by contract, including warranties as to title, merchantability, fitness for purpose, satisfactory quality, performance, non-infringement of any third party’s intellectual property or proprietary rights or product liability. Should a physical good be obtained as a free gift or upon redemption of a voucher, and the customer suffers any form of physical injury or damage, such injury or damage may be claimed against the manufacturer or distributor of the physical good and not against TIME, which is deemed not to be a supplier. 8 If the Promotion is the provision of a Monthly Rebate or One-off Rebate (as set out in the Promotion Information Details) to the customer, then if the customer terminates the service agreement with TIME before the expiry of the minimum period or if there is no minimum period specified, then twelve months from service activation date, then Eligible Customer shall not be entitled to receive any cash rebate for the unexpired period and TIME may seek to recover all earlier provided rebates on the basis that customer warrants to stay a customer of TIME for the minimum period or twelve months (as the case may be). 9 In addition, no advice or information obtained (whether orally or written) by the customer from TIME, or its directors, officers, employees, agents, suppliers, partners and/or subcontractors shall create any warranty or right to sue. 10 TIME reserves the right to revise, amend, or modify these Terms and Conditions during the Promotion Period and such revision, amendment, and/or modification shall be made available at www.time.com.my and is binding on all Eligible Customers. Continued access and use of the service shall deem to be your acceptance to the changes and updates to these Terms and Conditions. 11 If the Promotion Qualifications includes the signing up of a new service, then in such a case, all other terms and conditions governing the use of the new service shall apply in addition to these Terms and Conditions. 13 Capitalised words have the meaning as specified in the Promotion Information Details. If in the Promotion Information Details there are Special Promotion Terms drawn up, then such Special Promotion Terms shall prevail over these Terms and Conditions in the event of conflict, inconsistency or ambiguity. This promotion is available only to Eligible Customers who meet the Promotion Qualifications during the Promotion Period only and is subject to the Promotion Terms and Conditions available at www.time.com.my/terms-and-conditions. Acceptance of a promotional gift, vouchers, discounts or rebates by Eligible Customers will be deemed to be acceptance of the Promotion Terms and Conditions. Promotion Description TIME is offering a RM50 monthly discount to new subscribers who sign up for the TIME Fibre Business Internet 20Mbps plan through TIME’s dealers or client managers, as well as via TIME’s online portal at http://www.time.com.my/, for all buildings where TIME provides the relevant services during the Promotion Period. Promotion Qualifications An occupant of any building who signs up with a TIME dealer, client manager or online during Promotion Period. 1 This Promotion is only applicable during the Promotion Period. TIME reserves the right to cease and/or cancel the Promotion at any time before the expiry of the Promotion Period without any prior notice to Eligible Customers. 2 This Promotion is not to be construed in any way howsoever as a contract of sale, exchange, lease, hire-purchase, or hire between TIME and the Eligible Customer. 3 his Promotion is only available to Eligible Customers. In order to be an Eligible Customer, customers must meet the Promotion Qualifications. Any customer who does not meet the Promotion Qualifications and is not an Eligible Customer is not entitled to the provision of the Promotion. 4 TIME may change, modify, amend or cancel the Promotion at any time during the Promotion Period, including changing, modifying or amending the Value and/or type of free gift that is offered, the Value and/or type of voucher offered (including the provider of the voucher), the Value of the discount offered or the Value of the cash rebate offered (as may be applicable depending on the type of Promotion). Nothing herein stated shall imply that an Eligible Customer is to receive any other benefit beyond that stated in the Promotion Information Details nor that TIME is obliged to provide the equivalent Value if TIME changes, amends or modifies the Promotion. 5 If there are multiple promotions available during the Promotion Period, and the customer is an Eligible Customer for more than one promotion, the customer must choose only one promotion. A customer cannot make multiple choices of the promotions, nor do anything to secure or gain the benefits offered in multiple promotions. Once the customer has chosen the promotion, the customer is no longer eligible for any other promotions that are available during the same period of time. 8 If the Promotion is the provision of a Monthly Rebate, Monthly Discount or One-off Rebate (as set out in the Promotion Information Details) to the customer, then if the customer terminates the service agreement with TIME before the expiry of the minimum period or if there is no minimum period specified, then twelve (12) months from service activation date, then Eligible Customer shall not be entitled to receive any cash rebate for the unexpired period and TIME may seek to recover all earlier provided rebates or discounts on the basis that customer warrants to stay a customer of TIME for the minimum period or twelve (12) months (as the case may be). Promotion Description TIME is offering monthly rebates to new subscribers who sign up for the TIME Fibre Business Internet 50Mbps and 100Mbps plans through TIME’s dealers, client managers and via TIME’s online portal at http://www.time.com.my/, for all buildings which TIME provides the relevant services during the Promotion Period. Promotion Qualifications An occupant of any buildings who signs up with a TIME dealer, client manager or online during Promotion Period. 3 This Promotion is only available to Eligible Customers. In order to be an Eligible Customer, customers must meet the Promotion Qualifications. Any customer who does not meet the Promotion Qualifications and is not an Eligible Customer is not entitled to the provision of the Promotion. 4 TIME may change, modify, amend or cancel the Promotion at any time during the Promotion Period, including changing, modifying or amending the Value and/or type of free gift that is offered, the Value and/or type of voucher offered (including the provider of the voucher), the Value of the discount offered or Value of the cash rebate offered (as may be applicable depending on the type of Promotion). Nothing herein stated shall imply that an Eligible Customer is to receive any other benefit beyond that stated in the Promotion Information Details nor that TIME is obliged to provide the equivalent Value if TIME changes, amends or modifies the Promotion. 5 If there are multiple promotions available during the Promotion Period, and the customer is an Eligible Customer to more than one promotion, the customer must choose only one promotion. A customer cannot make multiple choices of the promotions, nor do anything to secure or gain the benefits offered in multiple promotions. Once the customer has chosen the promotion, the customer is no longer eligible for any other promotions that are available during the same period of time. 7 If the Promotion is the provision of a free gift or a voucher from TIME’s partners, suppliers or subcontractors, TIME and its directors, officers, employees, agents, suppliers, partners and/or subcontractors provide the Promotion on an "as is" basis and without any warranty or condition, whether express or implied, by law or by contract, including warranties as to title, merchantability, fitness for purpose, satisfactory quality, performance, non-infringement of any third party’s intellectual property or proprietary rights or product liability. Should a physical good be obtained as a free gift or upon redemption of a voucher, and the customer suffers any form of physical injury or damage, such injury or damage may be claimed against the manufacturer or distributor of the physical good and not against TIME, which is deemed not to be a supplier. 8 If the Promotion is the provision of a Monthly Rebate, Monthly Discount or One-off Rebate (as set out in the Promotion Information Details) to the customer, then if the customer terminates the service agreement with TIME before the expiry of the minimum period or if there is no minimum period specified, then twelve (12) months from service activation date, then Eligible Customer shall not be entitled to receive any cash rebate for the unexpired period and TIME may seek to recover all earlier provided rebates on the basis that customer warrants to stay a customer of TIME for the minimum period or twelve (12) months (as the case may be). This Promotion is only applicable during the promotion period beginning on the Commencement Date and shall continue in effect until otherwise determined by TIME. TIME reserves the right to cease the Promotion at any time without any prior notice. Online registrations MUST be submitted through TIME’s official website at time.com.my to qualify for the Promotion. If there are multiple promotions available, including this Promotion, the customer is only eligible for one promotion and must make a choice. Once the customer has chosen the Promotion, the customer is no longer eligible for other promotions that are available at the same time. This Promotion entitles the new subscriber to a one time RM100 off on first month bill based on the subscribed broadband package price only. TIME reserves the right to and may refuse the provision of RM100 Promo to any customers who do not meet the applicable criteria. Subscribers of TIME Fibre Home Broadband via Astro IPTV are NOT eligible for this promotion. TIME and its officers, directors, employees, agents, suppliers and/or subcontractors provide the Promotion on an “as is” basis and without any warranty or condition, whether express or implied. TIME and its officers, directors, employees, agents, suppliers and/or subcontractors specifically disclaim the implied warranties of title, merchantability, performance, fitness for a particular purpose, satisfactory quality or non-infringement of any third party’s intellectual property or proprietary rights. In addition, no advice or information obtained (whether orally or written) by the subscriber from TIME shall create any warranty. TIME reserves the right to revise, amend, or modify these Terms and Conditions and you shall be bound by such revision, amendment, and/or modification. Continued access and use of the Service shall deem to be your acceptance to the changes and updates to these Terms and Conditions. All other terms and conditions governing the use of the Service shall apply herein with the necessary changes. This promotion (details of which are set out below) is available only to Eligible Customers who meet the Promotion Qualifications during the Promotion Period only and is subject to the Promotion Terms and Conditions available here. Acceptance of the promotion gift, vouchers or rebates by Eligible Customers is deemed to be acceptance to the Promotion Terms and Conditions. TIME is offering monthly rebates to new subscribers who sign up for the TIME Fibre Business Internet 50Mbps and 100Mbps plans through TIME’s dealers, client managers and via TIME’s online portal at http://www.time.com.my, for all buildings which TIME provides the relevant services during the Promotion Period. This Promotion is only applicable during the Promotion Period. TIME reserves the right to cease and/or cancel the Promotion at any time before the expiry of the Promotion Period without any prior notice to Eligible Customers. This Promotion is not to be construed in any way howsoever as a contract of sale, exchange, lease, hire-purchase, or hire between TIME and the Eligible Customer. This Promotion is only available to Eligible Customers. In order to be an Eligible Customer, customers must meet the Promotion Qualifications. Any customer who does not meet the Promotion Qualifications and is not an Eligible Customer is not entitled to the provision of the Promotion. If there are multiple promotions available during the Promotion Period, and the customer is an Eligible Customer to more than one promotion, the customer must choose only one promotion. A customer cannot make multiple choices of the promotions, nor do anything to secure or gain the benefits offered in multiple promotions. Once the customer has chosen the promotion, the customer is no longer eligible for any other promotions that are available during the same period of time. If the Promotion is the provision of a Monthly Rebate or One-off Rebate (as set out in the Promotion Information Details) to the customer, then if the customer terminates the service agreement with TIME before the expiry of the minimum period or if there is no minimum period specified, then twelve (12) months from service activation date, then Eligible Customer shall not be entitled to receive any cash rebate for the unexpired period and TIME may seek to recover all earlier provided rebates on the basis that customer warrants to stay a customer of TIME for the minimum period or twelve (12) months (as the case may be). This promotion (details of which are set out below) is available only to Eligible Customers who meet the Promotion Qualifications during the Promotion Period only and is subject to the Promotion Terms and Conditions available at www.time.com.my/terms-and-conditions. Acceptance of the promotion gift, vouchers or rebates by Eligible Customers is deemed to be acceptance to the Promotion Terms and Conditions. TIME is offering a FREE 1 month broadband charges for any new subscribers who choose to sign up for TIME Fibre Home Broadband package during the promotional period. FREE 1 month broadband charges – RM149 / RM189 / RM299 – based on package subscribed. For NEW subscribers who sign up through all sales channel during promotional period. Only for sign-up on TIME Fibre Home Broadband, 24-months contract – not applicable for 12-months contract. Other promotions are not applicable. TIME is offering RM100 off the first bill for new subscribers who signs up for a TIME Fibre Business Internet plan through TIME’s official website at www.time.com.my. For new subscribers who signs up through TIME’s official website at www.time.com.my. This promotion is only applicable during the Promotion Period, and TIME may revise or extend the Promotion Period at any time without any prior notice. This promotion is only applicable to new registrations of TIME Fibre Business Internet packages during the Promotion Period who have registered for Exabytes Cockroach Startup Program (“Eligible Subscribers”). The Eligible Subscribers will receive a unique promo code after registration for the Exabytes Cockroach Startup Program. 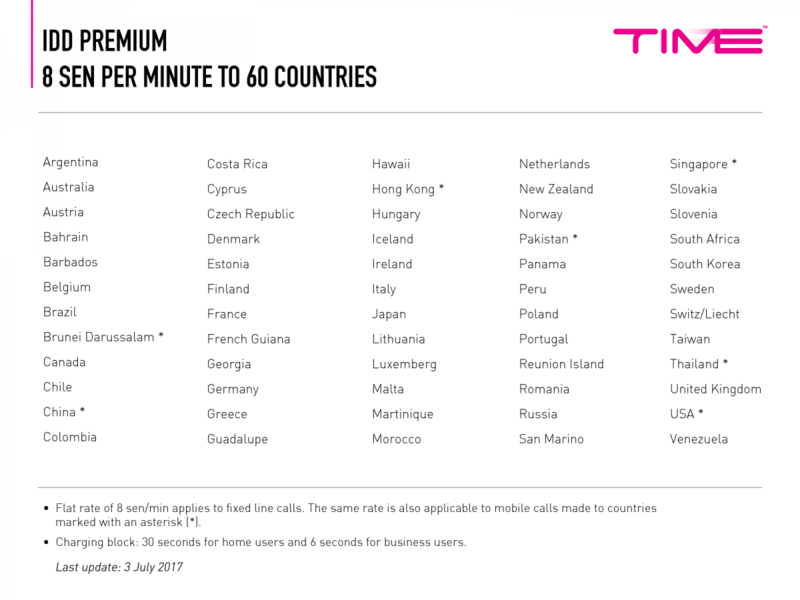 This unique promo code MUST be applied through online registration for TIME Fibre Business Internet services via TIME’s official website at www.time.com.my. TIME reserves the right to and may refuse the provision of this promotion to any subscribers who do not meet the applicable criteria. This promotion is provided on an “as is” basis and neither TIME nor its officers, directors, employees, agents, suppliers and/or subcontractors provide any warranty or condition, whether express or implied, any implied warranties of title, merchantability, performance, fitness for a particular purpose, satisfactory quality or non-infringement of any third party’s intellectual property or proprietary rights. In addition, no advice or information obtained (whether orally or written) by the subscriber from TIME shall create any warranty. All other terms and conditions governing the use of the TIME Fibre Business Internet service shall apply herein with the necessary changes. This promotion is only applicable during the Promotion Period. TIME reserves the right to amend the Promotion Period at any time without any prior notice. This promotion is only applicable for new registration and strictly available to selected customers who sign up for the Service package for 24 months within the specific promotion allocation. This promotion entitles new subscriber to a one time RM100 off the first month bill based on the subscribed broadband package price only. If there are multiple promotions available, including this Promotion, the subscriber is only eligible for one promotion and must make a choice. Once the subscriber has chosen the promotion, the subscriber is no longer eligible for other promotions that are available at the same time. TIME reserves the right to and may refuse the provision of the Promotion to any subscribers who do not meet the applicable criteria. This Reward is only applicable from 23 March 2017 – 26 March 2017 (inclusive) (“Reward Period”). TIME may revise or extend the Reward Period at any time without any prior notice. The Promotion is only applicable for subscribers whose Service has been successfully activated by 26 March 2017. For the duration of the Reward Period, all eligible subscribers stand a chance to win a mystery gift by logging in to the TIME Self Care Portal at selfcare.time.com.my, clicking on the Surprise Giveaway button and popping any of the floating balloons. There are a total of 500 gifts to be popped daily during the Reward Period. Subscribers who are successful in popping a balloon will be limited to only ONE (1) mystery gift throughout the Promotion Period, subject to the availability of the gifts. Subscribers who have won a mystery gift will have to redeem the gift within the specified validity period and adhere to the redemption terms and conditions for each gift/merchant which shall be separately prescribed. All mystery gifts are non-refundable and cannot be exchanged for cash. TIME reserves the right in its sole discretion to substitute the mystery gifts with alternative reward(s) of the same value. TIME reserves the right to and may refuse the provision of any benefits under this Reward to any customers at its sole discretion. This Reward is provided on an “as is” basis and neither TIME nor its officers, directors, employees, agents, suppliers and/or subcontractors provide any warranty or condition, whether express or implied, any implied warranties of title, merchantability, performance, fitness for a particular purpose, satisfactory quality or non-infringement of any third party’s intellectual property or proprietary rights. In addition, no advice or information obtained (whether orally or written) by the subscriber from TIME shall create any warranty. The Reward is only applicable for subscribers whose Service has been successfully activated by 26 March 2017. For the duration of the Reward Period, all eligible subscribers are entitled to a total of 500 minutes of free voice calls to any domestic fixed or mobile number, as well as IDD calls to 60 selected countries (click here for the full listing). The free minutes may be used by the subscribers as necessary and interchanged between domestic fixed and mobile number, as well as IDD calls (to the applicable 60 countries), up to a collective maximum of 500 minutes. Any unutilised balance at the end of the Reward Period will not be refunded. Voice calls exceeding the 500 free minutes shall be charged at the applicable rate or deducted from the subscribers’ voice plan, as the case may be. TIME reserves the right to and may refuse the provision of any benefits under this Reward to any subscriber at its sole discretion. This Reward Programme is only applicable during the Reward Programme Period, and TIME may revise or extend the Reward Programme Period at any time without any prior notice. This Reward Programme is only applicable to individual subscribers of the Service who have completed a minimum of one (1) year’s subscription and whose Service is active. Individual subscribers who have terminated their Service or who are serving their termination notice during the specified Reward Programme Period will not be eligible for this Reward Programme. This Reward Programme entitles the individual subscriber to a complimentary 1 cone x 1 single flavour scoop of Häagen-Dazs Ice Cream (“Reward”) at any of the 21 Häagen-Dazs outlets within Malaysia for take-away transactions only. The eligible individual subscriber will receive a notification (via a mode of communication deemed appropriate by TIME) on his/her anniversary month (i.e. the same month when the Service was activated at least one year prior) informing the individual subscriber that the Reward is eligible for redemption. Upon such notification, the individual subscriber must redeem the Reward within the same calendar month that the notification was received i.e. the individual subscriber’s anniversary month (“Redemption Period”). Redemption of the Reward is not permitted beyond the Redemption Period. The eligible individual subscriber is required to provide his/her MyKad number (or passport number for non-Malaysian subscribers) at any Häagen-Dazs outlet for verification of eligibility by Häagen-Dazs personnel. Each individual subscriber account shall only be entitled to one (1) redemption of the Reward during the Redemption Period, no duplication or additional redemptions are permitted. At any time, in the event any individual subscriber account has been or is to be transferred to a new account holder, such new account holder shall not be entitled to the Reward. Only the original account holder is entitled to redeem the Reward. TIME reserves the right to and may refuse the provision of the Reward Programme to any subscribers at its sole discretion. Subscribers of TIME Fibre Home Broadband via Astro IPTV are NOT eligible for this Reward Programme. This Reward Programme is provided on an “as is” basis and neither TIME nor its officers, directors, employees, agents, suppliers and/or subcontractors provide any warranty or condition, whether express or implied, any implied warranties of title, merchantability, performance, fitness for a particular purpose, satisfactory quality or non-infringement of any third party’s intellectual property or proprietary rights. In addition, no advice or information obtained (whether orally or written) by the subscriber from TIME shall create any warranty. TIME excludes all liability and the subscriber shall assume full liability and responsibility in the event of any liability, mishap, injury, loss, damage, claim or accident resulting from your participation and redemption under this Reward Programme. In accessing to and/or using this Website the Customer hereby agrees to abide by the following terms and conditions. If the Customer does not wish to be bound by these terms and conditions, the Customer may not access or use this Website. The Customer’s use or access of this Website constitutes the Customer’s agreement to these terms and conditions. ”Content” means the text, information, images, photographs, software, products, graphics, logos, illustrations, descriptions, data, services and all other material provided on this Website, as well as the selection, assembly and arrangement thereof. "Law" means and includes the Communications and Multimedia Act, 1998, its regulations and any other laws, Regulations, Statutes, Acts or By-laws currently in force in Malaysia from time to time. "Customer" means the party who has agreed to subscribe to or utilise the Services stated herein. "Services" means any functions, features, communication facilities or facilities made available by TIME from time to time subscribed or to be subscribed by the Customer in connection with the Services. "TIME" means TIME dotCom Bhd. (formerly known as "TIME Telecommunications Holdings Bhd.") (Company No. 413292-P), a company incorporated in Malaysia under the Companies Act, 1965 having its registered address at No.14, Jalan Majistret U1/26 Hicom Glenmarie Industrial Park 40150 Shah Alam Selangor Darul Ehsan and/or its subsidiaries licensed to provide the Services. TIME reserves the right to amend, modify or vary at any time without any prior notice to the Customer, the terms and conditions herein contained and/or the Specific Terms and Conditions and the Customer shall be bound to observe and comply with any such variation, addition or amendment. Notice of such changes may be given to the Customer and/or up-dated in this Website but the changes shall take effect from the date the changes were made. The Customer shall be deemed to be apprised of and be bound by any modification by TIME to these terms and conditions and/or the Specific Terms and Conditions. ANY ACCESS OR USE OF THIS WEBSITE BY THE CUSTOMER AFTER NOTICE OF REVISIONS OR ADDITIONS TO THESE TERMS AND CONDITIONS AND/OR THE SPECIFIC TERMS AND CONDITIONS SHALL CONSTITUTE AND BE DEEMED TO BE THE CUSTOMER’S AGREEMENT TO SUCH REVISIONS OR ADDITIONS. Any links to third party sites from this Website shall not be construed as a form of authorisation, endorsement, sponsorship nor any partnership whether expressly or implied. TIME is not in control of the third party sites and shall not be responsible for the contents of the third party sites. The Customer shall bear all risk in accessing the third party sites and in the using of the products and services contained therein. The text, information, images, photographs, software, products, graphics, logos, illustrations, descriptions, data, services and all other material provided on this Website, as well as the selection, assembly and arrangement thereof, are referred to collectively as the "Content". The Content may contain errors, omissions, or typographical errors or may be out of date. TIME may change, delete, or update any Content at any time and without prior notice. The Content is provided for informational purposes only and is not binding on TIME in any way except to the extent it is specifically indicated to be so. The Customer may view and use the Content only for the Customer’s personal information and for ordering on the products, services offered in this Website, and for no other purpose, and the Customer shall retain intact all copyright and other proprietary notices. Except as provided in the foregoing, TIME does not grant to the Customer or any person any right to use, reproduce, copy, modify, transmit, display, publish, sell, license, create derivative works, publicly perform, or distribute by any means, method, or process whatsoever, now known or hereafter developed, any of the Content on or transmitted through this Website, including without limitation by transferring, downloading or otherwise copying any Content onto any disk drive or other storage medium. Any use of the Content, except as specifically permitted in these terms and conditions or as otherwise expressly permitted in the Content or in writing signed by TIME, is strictly prohibited. TIME takes no responsibility for the accuracy, validity, reliability, suitability or effect (whether harmful or otherwise) of the Content. Further TIME does not make any form of representations in any manner whatsoever (whether with regard to the accuracy, validity, reliability, suitability, effect or any other matter) in relation to the Content for any purpose. The Content is provided without warranty of any kind either express or implied, including but not limited to implied warranties of merchantability and fitness for a particular purpose, title, non-infringement, security or accuracy. TIME shall not be liable for any loss or any damages sustained by reason of any disclosure, inadvertent or otherwise in any information concerning the Customer's account particulars. Neither shall TIME be liable for any error, omission or inaccuracy with respect to any information disclosed. TIME shall not be liable to the Customer for any cost, claim, liability, expense, demand or damages whatsoever (including but not limited to any loss of profits, loss of savings or incidental, special, indirect or consequential damages), arising out of or in connection with the Content or the use or inability to use or performance available from the Services or the Website even if such loss was reasonably foreseeable by TIME or TIME had been advised by the Customer of the possibility of the Customer incurring the same. While every care is taken by TIME in the provision of the Services, TIME shall not be liable for any loss of information howsoever caused whether as a result of any interruption, suspension or termination of the Services or otherwise or for the accuracy of the Content or quality of information available, received or transmitted through the Services. Further, the Customer agrees that TIME does not warrant, represent or covenant that the functions and/or materials contained in this Website will be uninterrupted or error free, or that the defects will be corrected or that this Website or the server are free of viruses or represents the full functionality herewith. But in case of such interruption or loss of use of the Services, and unless specified otherwise TIME shall make every effort to restore the Services as soon as reasonably possible. The Customer shall be solely responsible for ensuring that in using the Services all applicable laws, rules and regulations for the use of any telecommunications systems, service or equipment shall be at all times be complied with. In accessing or utilizing this Website, the Customer shall comply with and not to contravene with all applicable laws of Malaysia relating to the Services and not to infringe any intellectual property right of any other sites. The Customer shall not use this Website for any purpose that is unlawful or prohibited or in a manner which could damage, disable, overburden or impair this Website or interfere with the enjoyment or use by any other party of this Website. TIME shall not be responsible in assuring confidentiality of information and materials transmitted via this Website. It is recommended that the Services shall not be used for the transmission of confidential information. Any transmission of confidential information via this Website shall be at the Customer's own risk and TIME shall not be held liable in connection therewith. However, TIME reserves the right at all times to disclose any information as may be deemed necessary to satisfy any applicable law, regulation, legal process or governmental request or to edit, refuse to post or to remove any information or materials, in whole or in part. TIME reserves the right in its sole discretion, to terminate the Customer's access to any or all of this Website and the related services or any portion thereof at any time without giving any prior notice. The Customer undertakes and agrees to indemnify, save and hold harmless TIME at all times against all actions, claims, proceedings, costs, losses and damages whatsoever including but not limited to libel, slander or infringement of copyright or other intellectual property rights or death, bodily injury or property damage and howsoever arising which TIME may sustain, incur or pay or as the case may be, which may be brought or established against TIME by any person whomsoever arising out of or in connection with or by reason of the operation, provision or use of the Services, by reason of or pursuant to this Agreement and which are attributable to the act, omission or neglect of the Customer, its servants or agents. TIME shall not be liable for any breach of this Website arising from causes beyond its control including but not limited to Acts of God, insurrection of civil disorder, war or military operations, national or local emergency, acts or omissions of government, highway authority or other competent authority or of any third party, industrial disputes of any kind (whether or not involving TIME's employees), fire, lightning, explosion, flood, subsidence, inclement whether acts or omissions of persons or bodies for whom TIME are not responsible or any other cause whether similar or dissimilar outside TIME's control. In the event any terms or conditions in this Website is found to be unlawful or illegal, such term or condition shall be excluded and such exclusion shall not affect the enforceability, legality and lawfulness of this Website in any way. Any failure, delay or neglect by TIME in enforcing any terms or conditions of this Website shall not be deemed a waiver of any of TIME's rights or as affecting the validity of the whole or any part of this Website. This Website is governed by the laws of Malaysia. The Customer hereby consents to the exclusive jurisdiction and venue of the courts in Malaysia in all disputes arising out of or relating to the use of this Website. Use of this Website is unauthorised in any jurisdiction that does not give effect to all provisions of these terms and including without limitation this paragraph. If any part of this Website is determined to be invalid pursuant to applicable law including, but not limited to, the warranty disclaimers and liability limitations set above, then the invalid or unenforceable provision will be deemed superseded by a valid, enforceable provision most closely matches the intent of the original provision and the remainder of this Agreement shall continue in effect. TIME makes no representations that the content of this Website complies with any laws abroad. TIME bears no responsibility for the access of this Website from abroad. All rights reserved. All contents in this Website including but not limited to the text, images, registered trademarks as well as trademarks which are subject to pending applications are owned and controlled by TIME for these purposes and are protected by intellectual property rights. Such trademarks and service marks may not be used except as permitted in these terms and condition or with written permission from TIME. The Customer agrees that this Website shall only be used for lawful purposes. If the Customer is dissatisfied with this Website or the terms and conditions, rules, policies, guidelines or practices of TIME in practising this Website, the Customer's sole and exclusive remedy is to discontinue using this Website. In the event of any conflict between the terms and conditions herein contained and the rules and/or specific terms appearing on this Website relating to the specific material, the latter shall prevail. "Services" Means collectively the products and services offered by TIME over its communications network. and other incidental and associated purposes relating to any of the above. otherwise as required or permitted under Malaysian law, including without limitation, the Personal Data Protection Act 2010. Save and except with your express consent, TIME shall maintain strict confidentiality of your Personal Data and not disclose any portion or part thereof to any other entity or third party aside from the ones listed in 4.1 above. You hereby agree and accept that by registering and/or continuing to use the Services, you authorise and consent to your Personal Data being processed by and where required, disclosed to classes of third parties as identified by TIME in Clause 4.1 above for the purposes of TIME providing the Services to you. For the avoidance of doubt, you also hereby explicitly consent to TIME processing any sensitive personal data relevant for such purposes. Notwithstanding anything to the contrary, you may at any time withdraw your consent to TIME processing any Personal Data of yours or to any part or portion of the processing by sending to TIME at the address set out below a written notice of withdrawal and within the period prescribed under the Act, TIME shall take all necessary measures to give effect to your withdrawal of consent, to the extent that such withdrawal does not conflict with any of TIME's other legal obligations. You shall, upon written request, be granted access to all Personal Data held or stored or processed by TIME. To avoid confusion, "access" for the purposes of this provision shall mean notification of such Personal Data of yours that is being processed by or on behalf of TIME and to have a copy of such Personal Data communicated or conveyed to you in an intelligible form of TIME's choosing. You may at any time make a written request to TIME to correct any Personal Data of yours that is inaccurate, incomplete, misleading or out-of-date and TIME shall, upon receipt of your written request for correction(s) and within the period prescribed under the Act, take all necessary measures to give effect to such correction(s). TIME shall ensure that all Personal Data collected by it shall be stored and/or filed in such manner as to ensure that the Personal Data maintains its accuracy, integrity, remains confidential, is protected against loss, misuse, modification and unauthorised or accidental access, disclosure, alteration, destruction or manipulation. TIME shall store and/or retain all Personal Data only for as long as required for the fulfilment of the purposes stated in Clause 3 above or pursuant to any legal obligation imposed upon TIME in its operation of the Services or by virtue of any applicable law that may from time to time be in force. (d)	where access is regulated by another law. Where despite TIME's best efforts, there is unauthorised access, modification, alteration, misuse, tampering or abuse of Personal Data caused by the malicious or fraudulent or criminal acts or conduct of a third party not being under the control or direction of TIME. provide us with the accurate and complete Personal Data of yourself and/or any relevant person (including their consents) for purposes of acquiring and/or subscription of the Services. update us as and when such Personal Data provided earlier to us becomes incorrect or out of date by contacting our Customer Service as stipulated in Clause 9.1 above. agree that it shall be your responsibility to advise TIME in writing in the event there is any relevant change in the information including personal data supplied to TIME which requires action on the part of TIME. Please note that all notifications or other communications from you to TIME must be in writing, legible and contain your full name, current address, NRIC number and contact particulars. TIME reserves the right not to entertain any notices or communications which do not contain the foregoing particulars, are illegible, incomprehensible or where the party concerned cannot be contacted or where contact particulars are found to be incomplete, inaccurate or in error.